tamed river due to six mainstem reservoirs on the middle river and channelization and levee construction along the lower river, the Missouri historically experienced March and June flood pulses that inundated the extensive bottomland forests, occasional prairies, oxbow lakes, and shallow, temporary wetlands of its active flood-plain (Galat et al. 1998). By 1990, approximately 50 species of plants and animals of the regulated river were of conservation concern. When record flooding occurred along the lower Missouri River in 1995 and 1996, reconnection of the lower Missouri River with its floodplain benefited numerous species. Emergent and floating-leaved macrophytes that rely on vegetative reproduction and are adapted to flooding recovered quickly, and more and different fish species were observed, particularly in flood-connected water bodies where turtle species richness also was highest. Although it is infeasible to advocate periodic flooding of all of the Missouri's flood-plain, these postflood findings demonstrate the resiliency of floodplain communities and the restorative potential of recurrent controlled flooding in suitable areas. Some great rivers remain largely unregulated and flood regularly over vast areas of forest and wetland, including the Amazon, Orinoco, and Mekong. Many fishes in the Mekong make upstream breeding migrations during the wet season, spawning in inundated areas (the pelagic "whitefish" species), or move laterally into flooded forest (the benthic "blackfish" species) (Dudgeon 2000). Because fish production in tropical rivers is positively correlated with extent of flooded area and fluctuates among years with the size of flood peaks (Welcomme 1979), fish production and human livelihoods are likely to be harmed by river regulation. Recently completed hydropower dams as well as others under construction on the Mekong are expected to decrease seasonal inundation around Tonle Sap Lake, and almost surely will diminish its productive fishery on which many depend (Campbell et al. 2006). From small drainage ditches that return water to a river a short distance downstream, to interba-sin diversions that connect historically distinct river systems, to massive plumbing schemes that alter drainage patterns of large regions, canals and water transfers have had an effect upon rivers rivaling that of dams. Indeed, diversion projects typically are combined with impoundments and dams, either to bring water to the impoundment for added hydropower, or to send water though pipes and canals for irrigation and navigation. The extent of canal construction and channelization is considerable. Within the United States, some 26,550 km of channelization work had been completed by 1977, and a further 16,090 km were proposed (Leopold 1977). Surveys conducted in the United Kingdom and Denmark also document extensive channelization (Brookes 1989). Quinn (1987) counts 54 interbasin diversions in Canada scattered across nine provinces whose total volume, if consolidated, would be the third largest Canadian river, after the St. Lawrence and McKenzie. Nearly all of the Canadian diversions are attributable to hydro-development (Bocking 1987). The channelization of small streams, primarily to improve conditions for agriculture, is widespread. 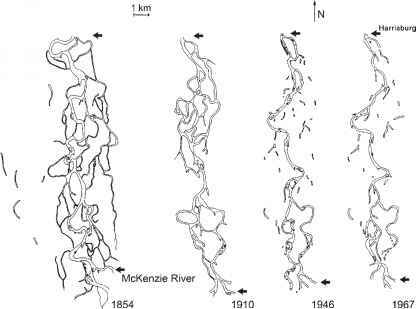 More than 90% of all lowland stream reaches in Denmark, Holland, and Britain have been channelized, mainly during an intensive period of stream modification between 1920 and 1970 (Pedersen et al. 2006). This practice is also widespread in agricultural areas of the Midwest (Landwehr and Rhoads, 2003). Eight states in the Great Lakes and cornbelt regions, with soils that are highly productive when drained, account for nearly 80% of the agricultural production of the United States (Fausey et al. 1995), and so the economic benefits are uncon-tested. Agricultural fields often are underlain by an extensive network of subsurface drainage tiles, which help to drain the soils but also result in faster runoff. Consequently, stream channels must be made wider, deeper, and straighter in order to convey greater stormflows. 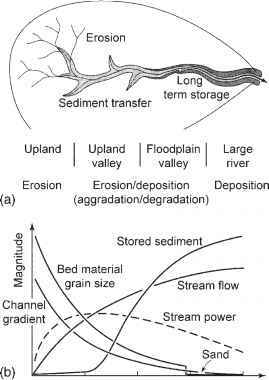 Channelization dramatically alters the shape and dimensions of the stream system (Brookes 1988) and these ditches often are managed by weed cutting, wood removal, and dredging of sediments to ensure flood conveyance. Unsurprisingly, both the fish assemblages (Moyle and Leidy 1996) and the macrophytes of highly managed systems have been shown to be strongly affected by these practices. Whereas small streams are widened and straightened for water conveyance, larger rivers commonly are modified for navigation, flood control, and utilization of floodplain land. The period 1750-1900 marked an era of ambitious regulation schemes for most of the large rivers of Europe (Petts 1989); changes in the channel of the Rhone (Figure 13 5) are typical. The United States had a particularly compressed history of canal construction during this era, as little of substance was constructed before 1800, and the railroads largely outcompeted barge traffic within 60 or so years. In between, however, some 7,000 km of artificial waterways were hand-dug, with only blasting powder as an aid. In countless rivers, removal of snags and deepening of the main channel have occurred to improve navigability for trade and transport. 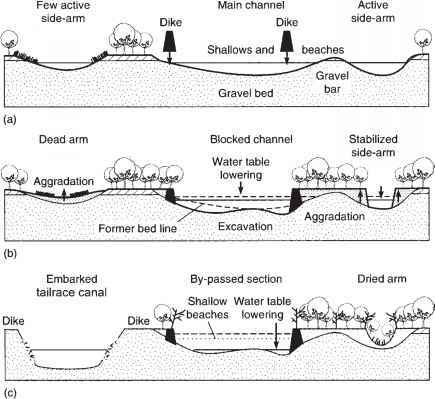 As Sedell and Froggatt (1984) document for the Willamette River in Oregon, the resulting loss of riverine channel structure has been great (Figure 13.6). The snags themselves provide important habitat for invertebrates, and in rivers with soft bottoms, snags are major sites of secondary production (Table 5.2). Shoreline length is a useful measure of habitat simplification owing to channel modifications. In rivers that still maintain a complex and dynamic interaction with their floodplains, such as the Tagliamento in Italy (Tockner and Stanford 2002), shoreline length can be as high as 25 km per kilometer of river length: in channelized rivers, that value can be as low as 2 km of shoreline per river kilometer. At an even larger spatial scale, interbasin water transfers to supplement water supplies are a common solution in water-thirsty regions. The California State Water Project transfers water from northern to southern parts of the state, Israel's National Water Carrier pumps water from the Sea of Galilee to supply the southern half of the country, and the Lesotho Highlands Project supplies Johannesburg, South Africa. Water shortages in China's Yellow River, which supports the industrial and agricultural activities of over 100 million people, are becoming severe, with days of no measurable flow occurring in 22 of the 28 years spanning 1972-1999 (He et al. 2005). The duration of desiccation has increased from an average of 8 days in the 1970s, to 11 days in the 1980s and 82 days in the 1990s, with the 1997 event lasting 226 days in the Lower Yellow River. With 3,382 dams providing the capacity to store fully 91% of the mean annual discharge, management of the available supply can be optimized, but water transfers to supplement the Yellow River are inevitable. Ten major diversion projects currently are planned, the largest of which is a south to north transfer from the Yangtse to the Yellow River. River and a network of irrigation canals (California Water Atlas 1979). None of this was practical so long as the flow of the Colorado River varied with the seasons and spring floods were allowed to escape to the sea. Regulation of the Colorado River's flow became imperative not just for hydropower, but to ensure year-round water supply for diversion. Nine major storage reservoirs, anchored by Lake Mead in the Lower Basin and Lake Powell in the Upper Basin, have a collective storage capacity of roughly four times the long-term average virgin flow of 18.5 x 109 m3 (15 million acre-feet). Practically no flow has entered the Gulf of California since 1961 (Figure 13.7), and today the mighty Colorado ends in a pipe in Tijuana, 225 km north of its natural terminus, according to an agreement that allots Mexico a final share of the river.